Sustainable packaging is becoming a higher priority for both brands and consumers – more now than ever before. With McDonald’s announcing its packaging will be 100% renewable and recycled by 2025, the term ‘eco-friendly packaging’ is clearly more than a buzzword. This echoes the sentiment of Millenials pushing brands to be more socially and environmentally responsible. 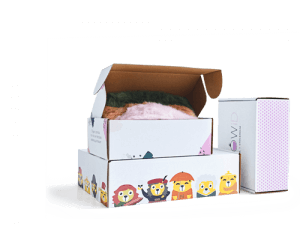 Implementing sustainable packaging in your brand’s operations is no longer an option – it’s a necessity. It’s an important business move to ensure that you reduce your environmental footprint, and increase brand loyalty amongst eco-conscious consumers. What is sustainable packaging and sustainable packaging design? With material science and packaging engineering developing at an incredible speed, more and more sustainable packaging options are on the market that can take care of a wide range of products. Breakthroughs in plant-based packaging and biodegradable plastics mean that it’s getting easier for your brand to reduce its carbon footprint. So let’s dive into the world of sustainable packaging, and see it’s benefits for your brand. But before we go too deep, bring yourself up to speed with the definition of sustainable packaging. Sustainable packaging is packaging that, over time, reduces its environmental footprint. Reusability: By creating a circular economy around the packaging, extending its lifecycle and usability. It’s simple to say that sustainable packaging is entirely about the environment, but it also should take into consideration economic and social factors. For example, plant-based packaging may seem like a viable option, but not if that means clearing endangered rainforests to grow crops. Similarly, sustainable packaging needs to consider the economic factor. To be feasible, it needs to be priced competitively over traditional oil-based/single-use packaging options. So yes, the definitions can get a bit messy at times. Labelling something ‘eco-friendly’ doesn’t mean that it’s sustainable. Similarly, labelling something as sustainable doesn’t mean that it’s ethical. 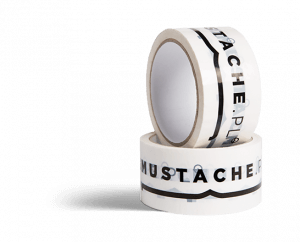 As definitions aren’t always black and white, it pays to ask your packaging manufacturer a number of questions. The Sustainable Packaging Coalition is a great resource to see the certifications of certain brands and products and to further your knowledge of sustainable packaging in general. Other bodies, like the Forest Stewardship Council, ensure that any wood-based products (like cardboard) are made from sustainably-sourced forests. 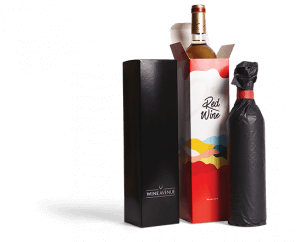 If your brand strives to be as environmentally friendly as possible, sustainable packaging, coupled with sustainable package design, is a potent combination. What is sustainable packaging design? Sustainable packaging design is designing product packaging with the main purpose of doing as little harm to the environment as possible. This can be achieved by using recycled material or designing your packaging with another purpose in mind. 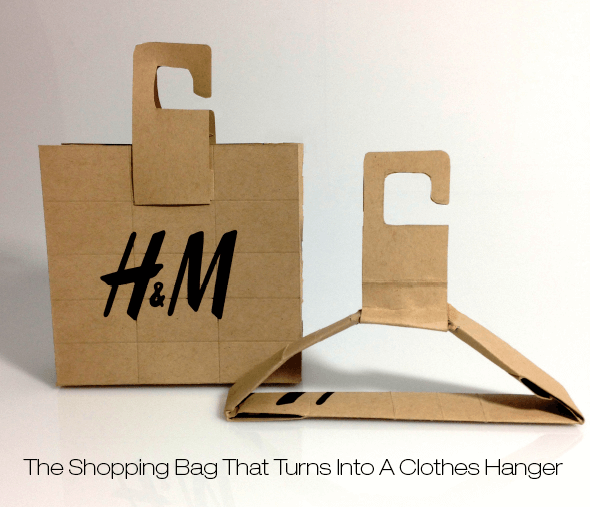 For example, this shopping bag from H&M that can be turned into a clothes hanger. 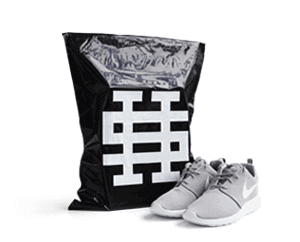 Not only are these bags made from less material than H&M’s traditional plastic bag, but the paper is 80% recycled. 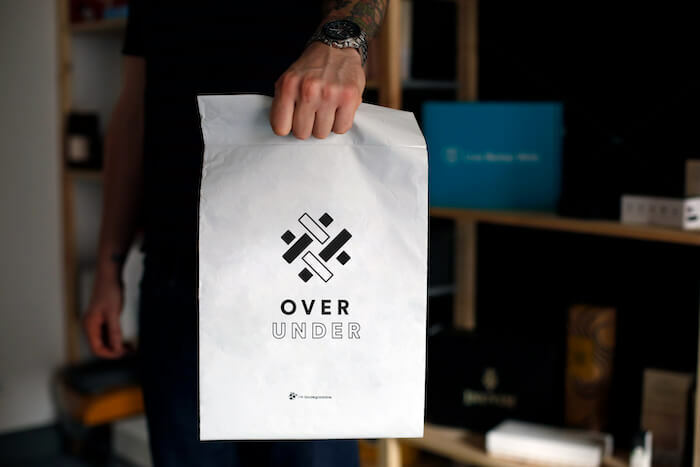 Need a paper bag for your brand made from 80% recycled cardboard? Start designing your own paper bags with handles now! H&M knows that its audience, people between 18 and 35, care about the environment and appreciate brands who go the extra mile by choosing eco-friendly solutions. Therefore, sustainable packaging design that’s executed with reusability in mind increases brand loyalty amongst their audience. Read below to see some examples of sustainable packaging. Implementing sustainable packaging requires some research to see how it can best complement your packaging design. Look at the examples below to see several examples of brands that have done exactly that. 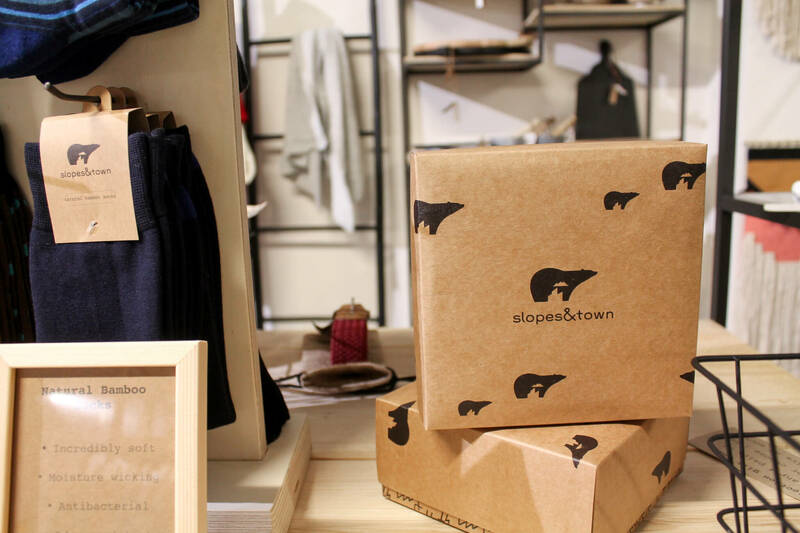 Slopes and town is a Dutch brand that sells belts, socks and other accessories based on environmentally friendly materials. Sheyn is a Vienna-based jewellery studio that focuses on simple yet elegant design. 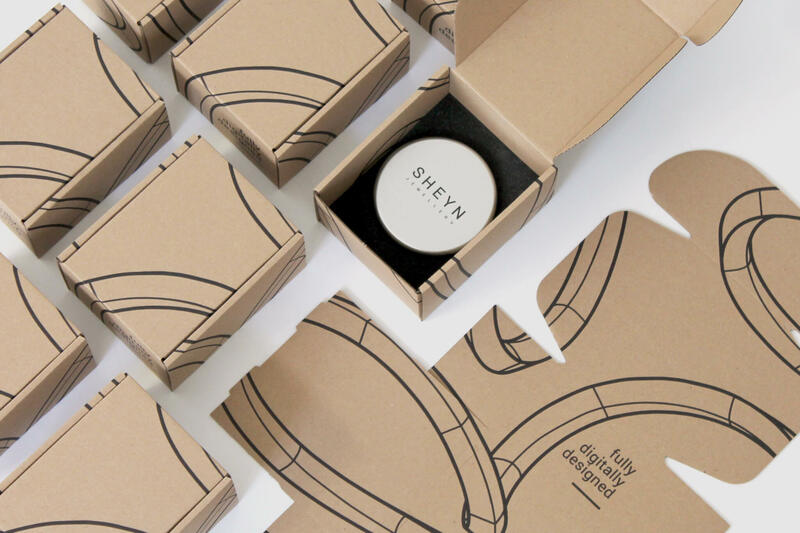 Sheyn have used an Eco mailer box made of 80% recycled material to take their unique design onto their packaging. 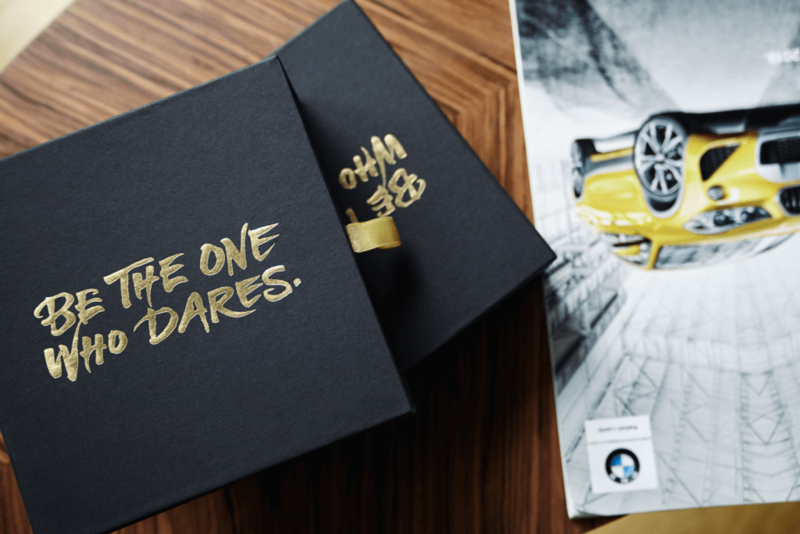 This gives their customer a truly memorable unboxing experience based around sustainable packaging. Monday’s Child is a British company that sells clothing for special occasions for young girls. The packaging that Monday’s Child uses tackles sustainability from the back – the box doubles as a doll’s house for its young users. By adding extra value to the packaging, a customer of Monday’s Child gets more value for money and the life of the packaging is extended. Biotika is a Polish manufacturer of soy candles and scented waxes. The brand stems from the love of nature and therefore goes above and beyond to leave a smaller footprint as possible. 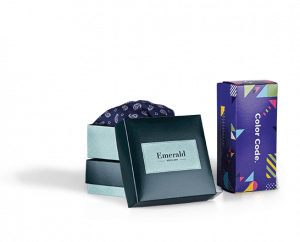 Plain textured cardboard boxes with a minimalist design let the products do the talking. 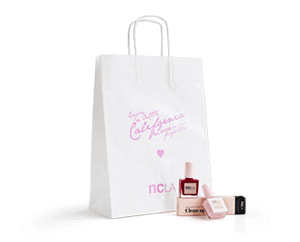 Neutral and organic colours add to the brand’s image, as does the recycled cardboard packaging itself! 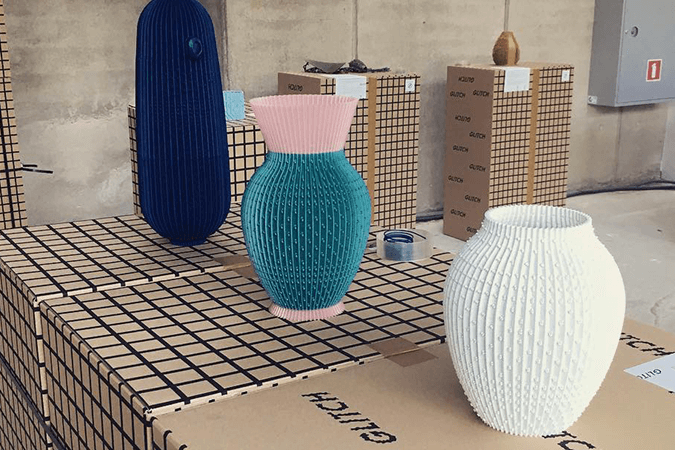 UAU Project is an art installation showing off the delicacies and beauty of 3D printed art. The installation tackled sustainability in a unique way – the boxes used to send the exhibition all over Europe doubled as the stage to show off the art itself. 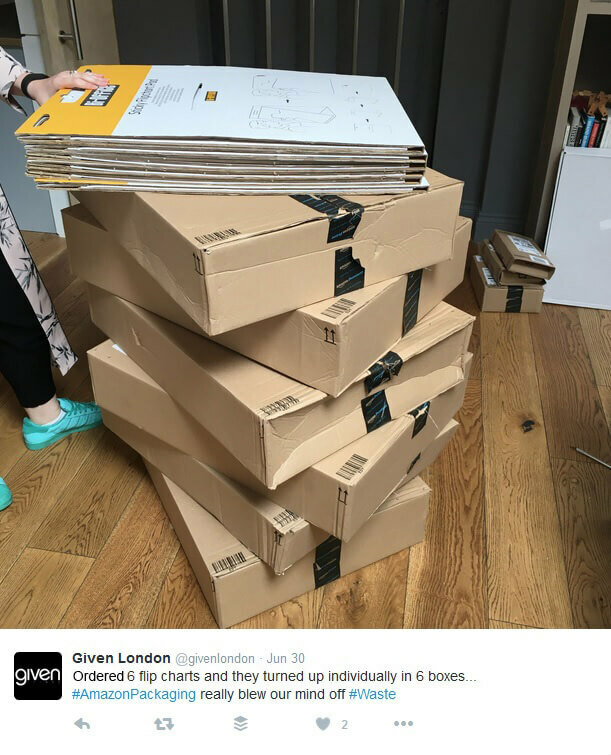 Large shipping boxes designed with the dual-purpose in mind meant that two problems were simultaneously solved – transport of the art as well as displaying it. There’s no need to go into detail about why sustainable packaging is important. If you’re reading this article, you know it’s crucial. But the push toward sustainable packaging isn’t just from the end consumer. 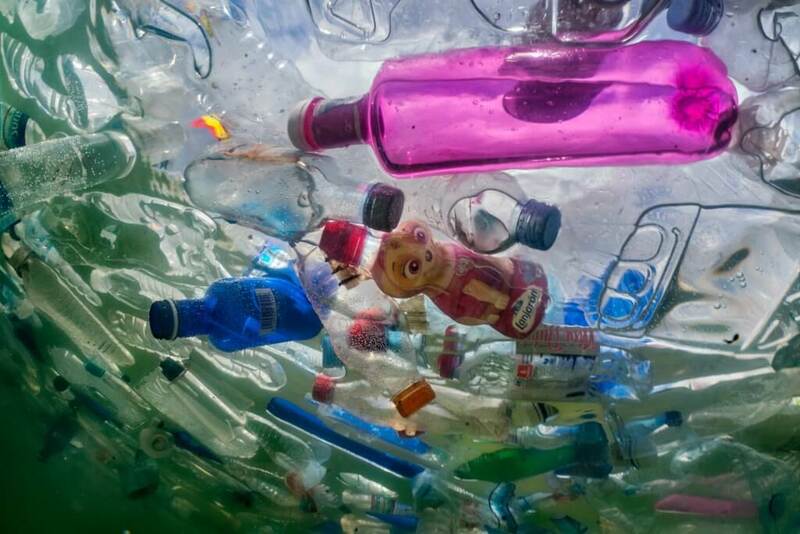 Large corporations like Unilever Australia have recently put pressure on the Australian government to do more in the plastic pollution battle. But sustainable packaging doesn’t mean you have to invest a load of money, nor compromise on form or function. Read below to see the best eco-friendly packaging materials on the market and how darn impressive they are. 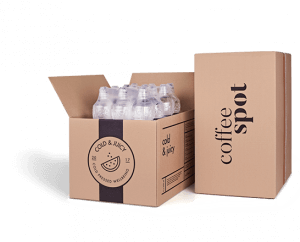 Many people consider the humble cardboard box as one of the most environmentally friendly, organic, ethical and sustainable packaging solutions out there. 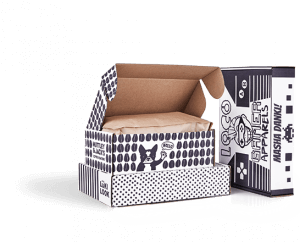 Corrugated cardboard and many other varieties of cardboard-based packaging are the go-to solutions for packaging sustainability because they work. While cardboard boxes come in many shapes and sizes, one of cardboard’s strengths is literally its strength. 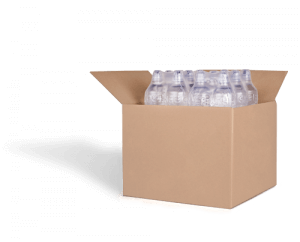 Double and triple walled cardboard boxes, when assembled correctly, can hold an incredible amount of weight and keep it secure throughout the shipping process. A simple cardboard box is also over 80% biodegradable. If it isn’t segregated when your customer throws it in the bin, it easily breaks down in landfill. 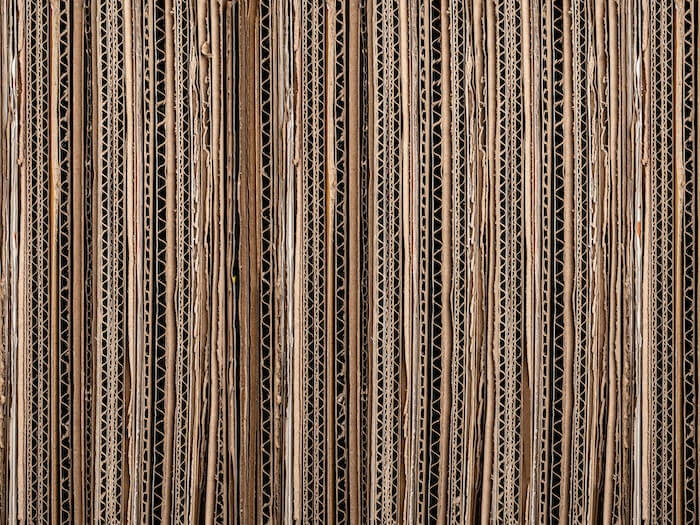 And if the material that cardboard is made from (paper pulp) isn’t already recycled, the raw materials used to make cardboard (trees) is managed incredibly well. But there’s more to eco-friendly packaging than cardboard. What happens when you need sustainable packaging that’s certified to come in contact with food? 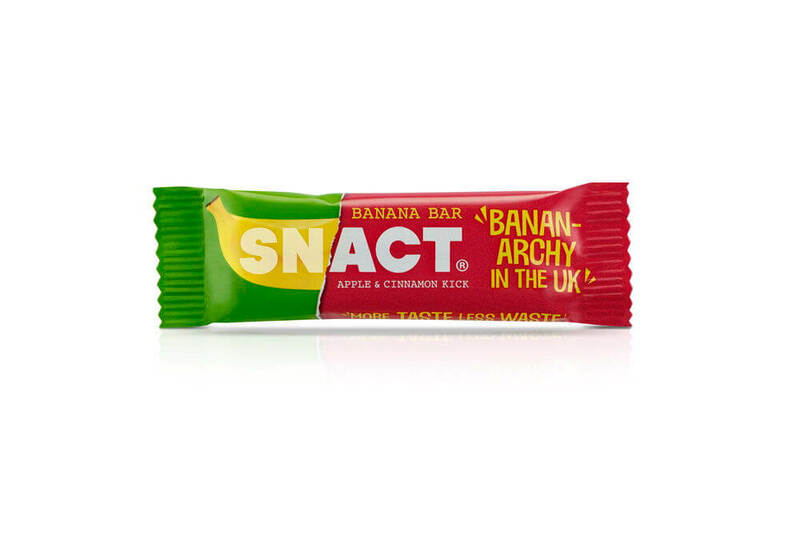 Well, take a look at Snact fruit bars. As a company, Snact is all about the reduction of waste. For starters, the product that they sell is made from banana peel – the perfectly edible part of the food that’s nearly always thrown out. Secondly, snack worked with Tipa to create packaging that’s 100% compostable. Throw your wrapper into the garden and watch it decompose. It worth noting, that single-use packaging isn’t the bad guy here. Single-use packaging that’s oil-based and ends up in landfill is the culprit. Single-use plastics, such as algae-based Agar, are made from red algae, a naturally occurring substance that’s available in abundance. This packaging is suited to pasta, cereals and other dry foods. With a little more refinement, materials like this can also battle single-use products like straws and spoons. So while the term ‘single use’ isn’t always bad, there are some common phrases in the world of eco-friendly packaging that do have negative connotations. When biodegradable packaging isn’t good. The shift towards consumers and brands wanting to be more environmentally friendly has led to some household words being twisted and contorted. These are some terms that have almost lost all meaning. Take, for example, the term biodegradable. This term conjures up pictures of the material sitting in the dirt and harmlessly decomposing into the earth around it – ultimately going back where it came from. Biodegradable plastics are being touted as the solution that can stop our reliance on single-use plastics. But the truth of the matter is that a majority of sustainable packaging solutions labelled ‘biodegradable’ will only break down in certain temperatures and atmospheric conditions. In other words, what may biodegrade in the dry sun in landfill, will stay perfectly intact while floating in the ocean. Which means that your biodegradable packaging isn’t actually biodegrading, and global marine pollution stays the same. The misinterpretation of these words means that your brand should do as much research as possible and be sure that whichever packaging you use will have as little impact on the environment as possible. Sometimes called bio-based plastics or corn plastic, plant-based packaging solutions are made from an organic compound that will, over time, decompose in just about any environment that it’s put in. 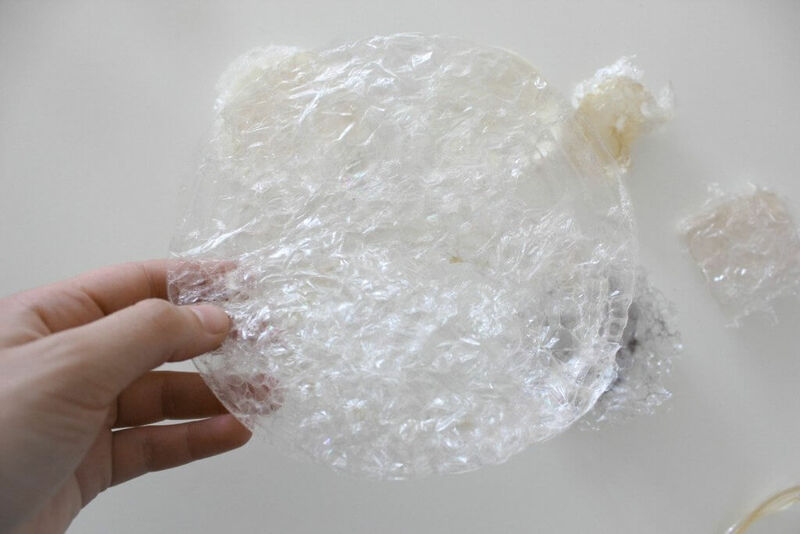 Polylactic acid (PLA) is a plastic substitute that’s made from fermented plant starch. With more and more countries banning plastic bags at grocery stores, PLA looks set to become the next-best option to single-use plastic bags. PLA can also be shaped into a more durable form of plastic, used in Packhelp’s Bio polymailers. 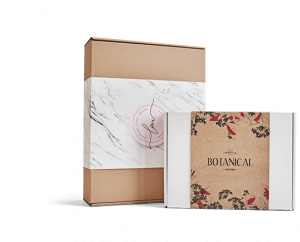 Bio Polymailers can be used to send items that don’t need the protection of a box. For example, a simple t-shirt or other clothing that’s durable. 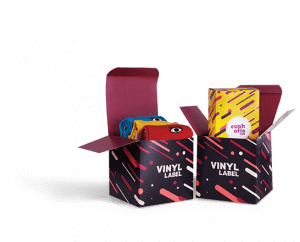 Alternatively, a Bio polymailer can be used to send products where the box itself is an asset – a pair of shoes, for example. 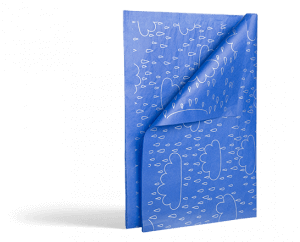 Design features like a resealable flap mean that a Bio polymailer can be used again if need be, thus increasing its versatility and lifespan. The fact that more brands are moving toward sustainable packaging is, inarguably, due to consumer behaviour. With the world becoming more environmentally conscious and more being done to battle climate change, taking care of the earth has never been more important. 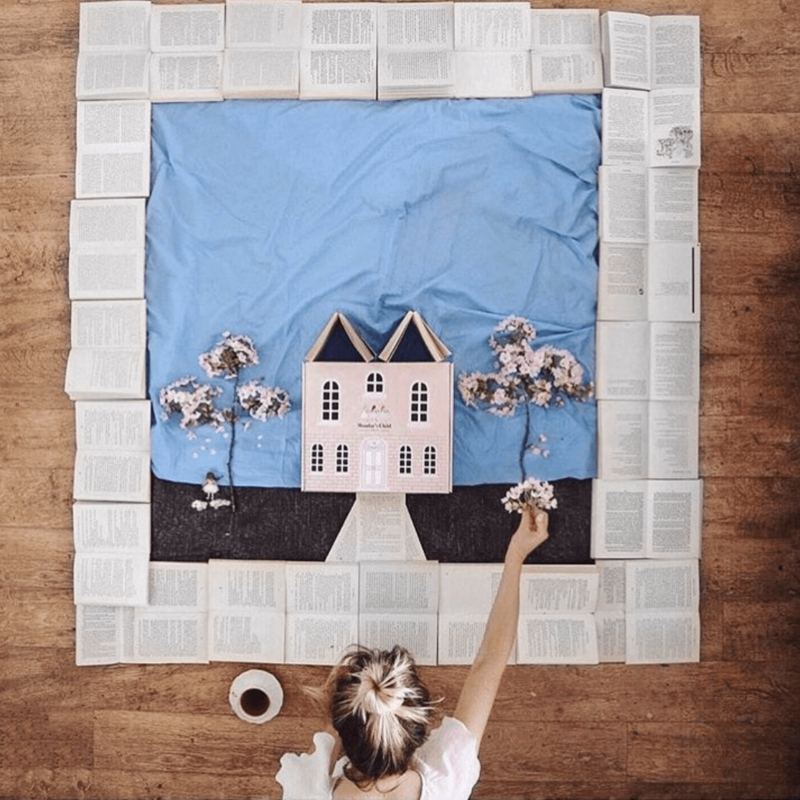 For many larger brands, adopting an ‘environmentally friendly’ policy is nothing more than a PR stunt – we consume with our eyes and a simple recycling logo doesn’t always carry a lot of weight. 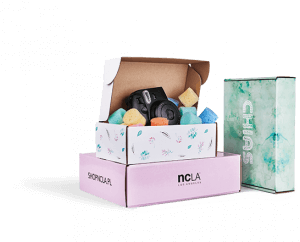 Even if sustainability and environmentalism aren’t at the forefront of your brand’s defining features, sustainable packaging can give you an edge of your competition. Your brand on a shelf in a retail store. Your product is placed directly next to the competition. A buyer has your product in one hand, and your competitors in the other. This customer is trying to figure out which product to purchase. They’re in ‘buying mode’ and just need one little thing to push them over the edge. ‘This packaging is made from 100% recycled material and will break down into non-toxic organic matter in 15 years’. If eco-friendly packaging isn’t part of your branding, it’s still important in the mind of the buyer, even if it’s not the most important thing to them. A well-placed statement may be all that’s needed to make a buyer commit to your product and not a competitor. But how can a brand that’s never been eco-minded make the change and implement sustainable packaging? If you’re a brand that’s considering using sustainable packaging, here are a few tips to make sure you get the most from the process. Whether you’re selling 1 product or several thousand, it’s best not to commit totally to sustainable packaging before you’ve tested the concept. You can do that by sampling packaging options. As just mentioned, it’s risky to commit to a new packaging solution before testing it. 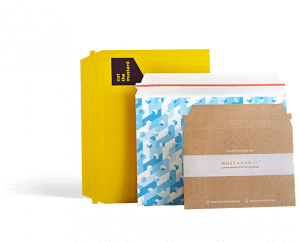 Consider ordering a sample pack to inspect the quality of the packaging for yourself. Once you’re convinced that this is a practical option, then order in bigger quantities. Implementing new packaging can be a double-edged sword if done at the same time as launching a new redesign of the brand. A new logo, a new colour pallet and design assets can truly be complemented by sustainable product packaging. Price is obviously a factor that needs to be considered. 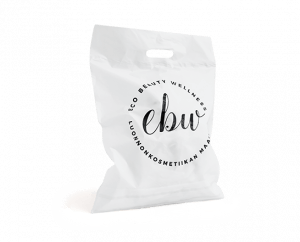 You may be surprised to know that packaging made from 80% recycled material can be had for as little as €0.26 per piece. Once you’ve settled on a sustainable packaging option, it’s important to calculate if you can absorb the cost of packaging or whether you need to increase prices accordingly. 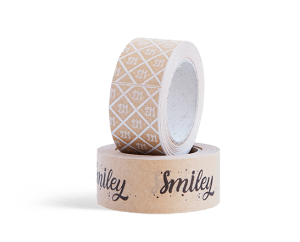 Part of testing how your brand (and customers) take up sustainable packaging, is to do so in small volumes. Order as little as 30 pieces and judge the reaction of your team and customers. When everything is assured, scale up your order size! FIFO stands for ‘First in, first out’ and it’s a method you might like to apply to your packaging. Before using your new packaging design, make sure that you’ve used up all your old packaging first. Once your customers have taken well to your new packaging solution, consider bringing the concept of sustainability to your product itself. An eco-friendly product in an environmentally friendly box is a double-edged marketing sword! A brand that aligns itself for the good of the environment is something that the world wants to hear about. It’s a moral that can make your brand stand out and be seen over your competition. Work your sustainability into your marketing campaigns and make sure that people know that you’re out there to help the environment. As a young packaging company, Packhelp knows only sustainability and working alongside the environment. We have a responsibility to care for the environment and help our customers do the same. Most small to medium brands want to sell their product in packaging that doesn’t damage the environment. That’s why every single cardboard product in our range is made from a minimum of 80% recycled cardboard. This means that when you order custom packaging from us, you’re getting a material that was a school book, cereal box or a bank statement in another life. 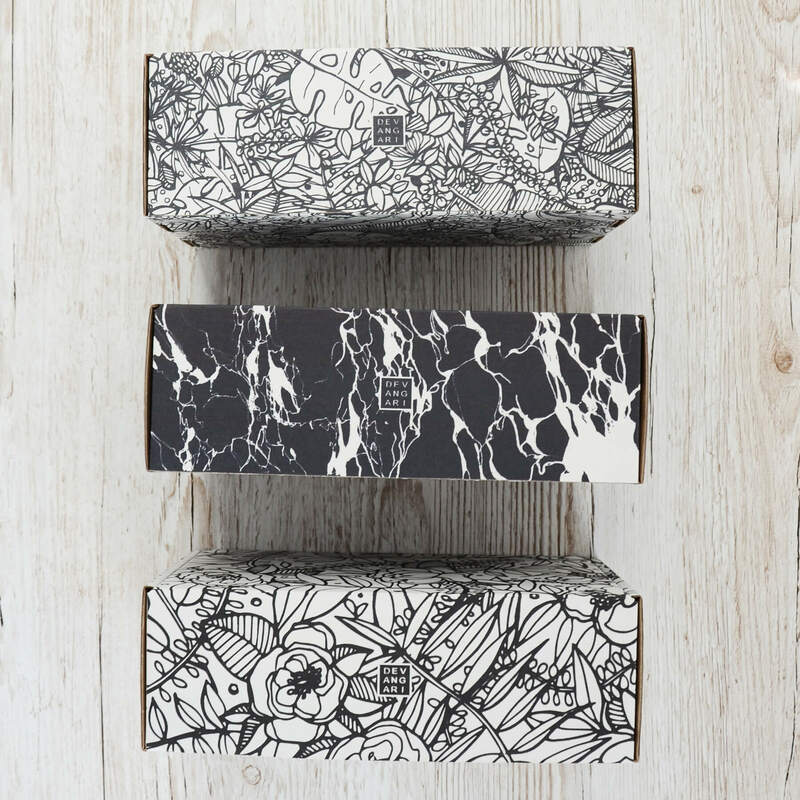 If you’re looking to get started with sustainable packaging, check out Packhelp’s range of customised packaging options, or contact us so we can help create your unique packaging idea. In this article, you saw the current state of sustainable packaging and how your small brand can start using it. You can now see how a brand can use sustainable packaging to build a better relationship with eco-minded customers. With a global shift toward fighting climate change, the way we approach packaging is set to grow and change. Rather than being an alternative option, sustainable packaging is only going to become more important. Start designing your sustainable packaging.